The Financial Lives of the Poets is Jess Walter's fifth novel. Matt Prior is only six days away from losing his house; his financial journalism website business (written in the form of poetry) was a total bust as well as his wife Lisa's ebay business. When Matt visits the local 7/11 to pick up milk for breakfast, he befriends two unlikely characters and smokes marijuana with them. Suddenly, Matt is inspired to find new ways to generate income for his family. The Financial Lives of the Poets is one of the more intelligent and wittier novels I've read recently. Jess Walter's humor is raw and easy to relate to, and the book is full of non-stop hilarity. At first, I really had to pace myself with The Financial Lives of the Poets because of how busy it is; after all, it seems as if every other sentence is a punch-line! However, after reading the first chapter on Matt's initial 7/11 experience, the novel glides along quite comfortably. The third chapter on social networking is my favorite; Matt goes on a tirade about the ridiculousness of it all and how he's been spying on his wife Lisa's online activity. Even funnier is how Matt eventually stalks Lisa's online lover at the local home improvement store with false intentions to build a tree house for his children. Many readers will find The Financial Lives of the Poets incredibly appealing (maybe even inspiring for some?) because Jess Walter mocks the current so-called tragic state of the economy and also the types of people you are required to encounter in the aftermath of generating debt, losing your job, losing your house, etcetera. Having experienced all of the above myself, it's always a sick, reassuring pleasure to know I'm not the only person who has suffered! 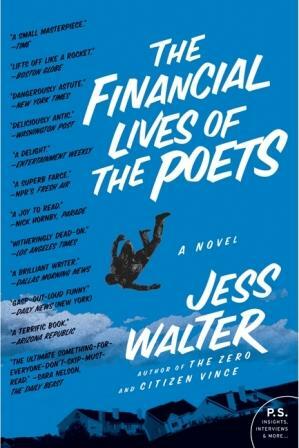 I recommend The Financial Lives of the Poets to all readers; specifically for those needing a laugh and appreciate smart humor, and most of all to those who have recently been the victims of life tragedies involving debt and job-loss. Other novels by Jess Walter include The Zero (2006), Citizen Vince (2004), and Land of the Blind (2003).